There was little crunch available in our test bag. The first couple of bites provided a crisp crack as they succumbed to bite pressure, but after this it was all rather mushy. These Crisps were mostly flat. There was little in the way of oil boils and surface bubbles. There was skin on edges, but the light yellow colour had no seasoning visible, just a small amount of oil in patches. 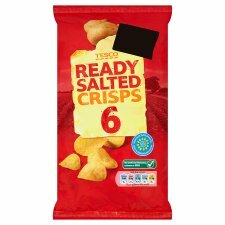 The phrase "Ready Salted" is rather peculiar to the UK. It doesn't actually mean anything. What is the "Ready" for? A Nose Plunge Test revealed little more than oily potato. The flavour was similar. There was clearly oil infused potato as the underlying flavour to very lightly salted Crisps.